Here we are going to explain how to block or disable Windows 10 ads. Windows 10 comes with a lot of advertisements built-in into the operating system and aimed to lure users to purchase more and more stuff. Windows 10 ads are based on browsing and Windows 10 apps download history in order to aim targeted ads to every users. Ads on Windows 10 are not restricted to free version only, even if you purchase license of Windows 10 Professional or Enterprise editions, ads will appear on your Windows 10 copy. However, luckily, there is a way to disable ads in Windows 10. In this article, you will learn various ways of managing and disabling Windows 10 advertisements. In Windows 10 Start menu, you see apps suggestions from time to time. And what’s more, most of the time these apps suggestion links take to the paid apps download pages that usually cost exorbitant amount of money, some apps on Windows Store cost as much as $70 – $80, you can say this is Microsoft’s way of making you spend more and more on paid apps, which in all honesty you should refrain from. On the other hand, these app suggestion ads take up precious little space on the Start Menu which you can use for something handy. Here’s how to block app suggestions in Windows 10. In order to stop suggested apps from poping up on the Start menu, head to Settings > Personalization > Start and disable the ‘Occasionally show suggestions in start’ option by turning the toggle OFF. One of the most dastardly things Microsoft’s introduced in Windows 10 is the introduction of ads in free pre-installed games, and game upgrade ads that pop up regularly that prompt users to buy full version. 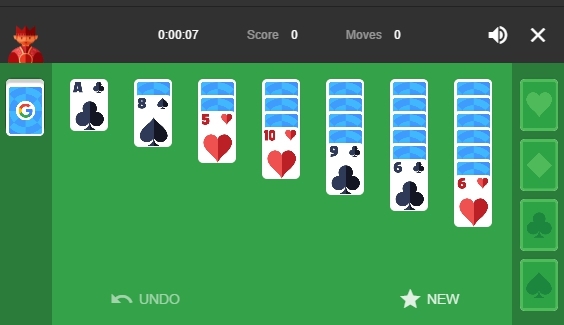 Famous Solitaire game on Windows comes pre-installed in Windows 10 but has built-in advertising as well as video ads of up to 30 seconds which you cannot skip on free version of the built-in games. Microsoft days that you need to pay somewhere around $10 per year to get rid of these ads. Apart from Solitaire, other Windows 10 games that used to be free are now available for yearly subscription fees. To stay away from such money grabbing antics, avoid these free built-in Windows games and instead go for free solitaire or other similar Windows 10 games by downloading free third-party version like Google’s free Solitaire which is ads free. Microsoft brought a new feature called Windows Spotlight in Windows 10 whose purpose is to show ads on the lock screen. Windows Spotlight shows ads, wallpapers, game ads like Halo, Assassin Creed and more and direct you to the Windows Store to buy the advertised item. These ads can get intrusive but you can avoid them by making some changes in the Windows 10 Settings app. 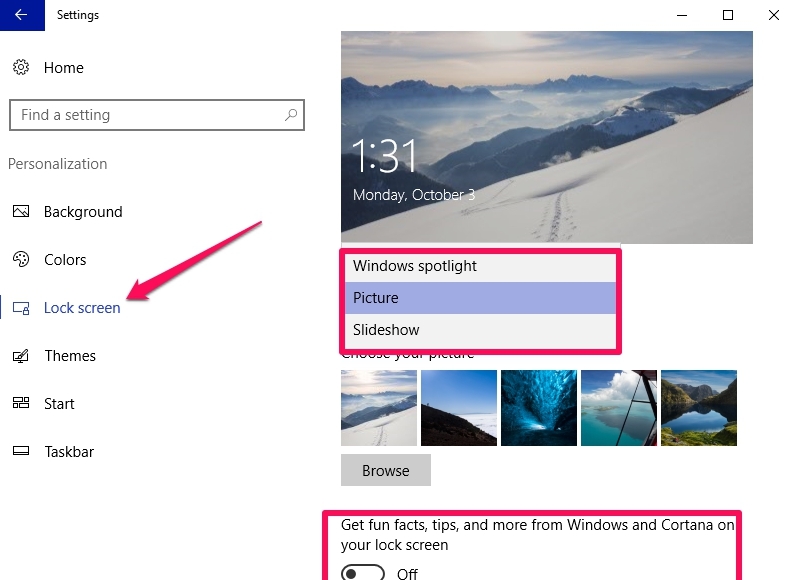 In order to disable Lock screen ads in Windows 10, navigate to Settings > Personalization > Lock Screen and change the background option from Windows Spotlight to ‘Picture’ or ‘Slideshow’. Its better that you switch off the ‘Get fun facts, tips, and more from Windows and Cortana on your lock screen’ option as well. One annoying aspect of Cortana is like a petulant child, it just doesn’t sit quietly on your PC but instead pops up repeatedly to encourage you to use its various function. It also pesters you with requests of trying new apps, programs and software which either you don’t need or are costly. However, you can stop Cortana from plaguing you with ads and requests. 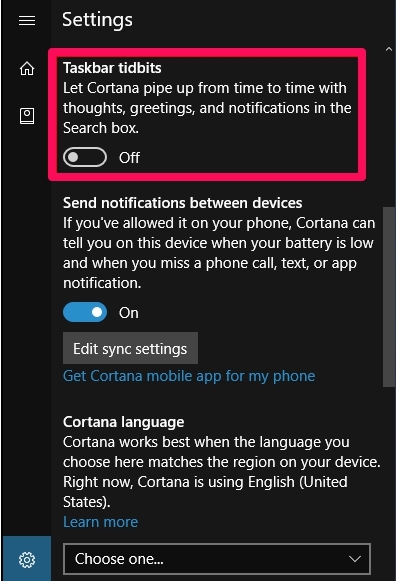 To do so, click on the Cortana Search bar, click the Settings icon, scroll down, and disable the ‘Taskbar Tidbits’ option. That’s it, you have successfully tamed Cortana from bombarding you with nagging suggestions. You can permanently disable Cortana as well. Those who have upgraded to Windows 10 Anniversary update can see this guide to disable Cortana on Windows 10 PC with anniversary update. When you upgrade or fresh install Windows 10, host of pre-installed apps and default games come with the new copy of the Windows 10 either from Microsoft or PC manufacturer. This is termed as ‘Microsoft Consumer Experience’. Previously it was possible to disable default apps and games from a group policy editor option, but the option was taken away after Windows 10 Anniversary update. 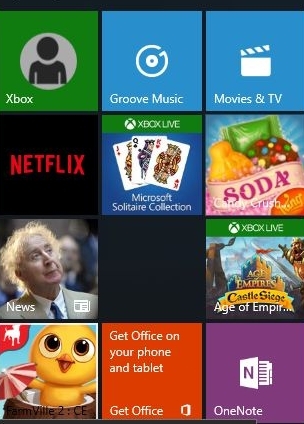 These apps appear as live tiles on the Start menu and take up space which you could use for your favorite apps. Here’s how you can remove these live tiles and promotional apps & games. Open Start Menu, locate any app you want to get rid of and right-click on it and select ‘Uninstall’ from the drop-down menu. Some live tiles on Start menu are just promotional links of apps that take you to the Windows Store download page for the app, they’re not yet installed on PC. To remove these tiles, right-click on the any tile and select ‘Unpin from Start’. There won’t be any ‘Uninstall’ option because tiles are just promotional download links, not actual apps. There are some apps that advertise to you but there is no way of uninstalling them such as Xbox and Windows Store tiles on the Start menu. 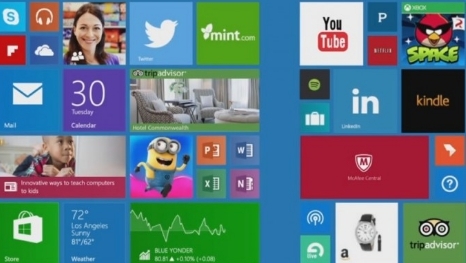 These live tiles feature games and apps that Microsoft want you to download on your PC. In order to disable such tiles, right-click on a tile and select More > Turn live tile off. 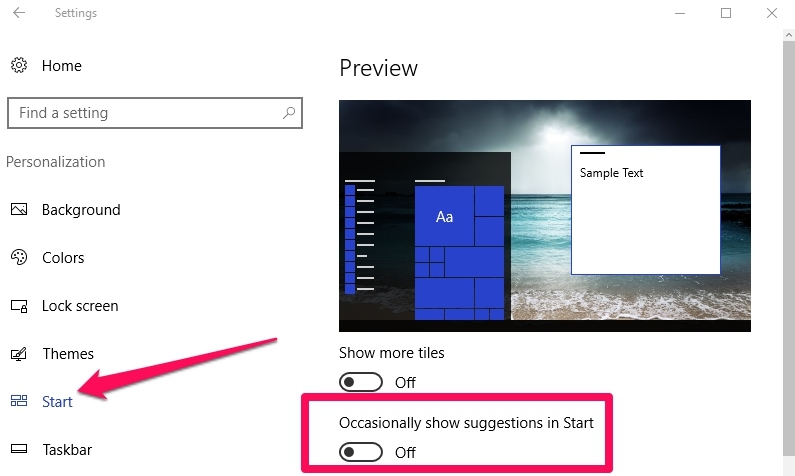 Or you can right-click on a tile and select ‘Unpin from Start’ to remove the tile from the Start menu. You can also unpin all tiles and only use the All Apps list to run apps. Get Office tile on the Start menu periodically pushes notifications to encourage you to purchase Office tool or upgrade to some new tool. You can disable these promotional notifications and ads by heading to Settings > System > Notifications & Actions, scroll down, and turn OFF the ‘Get Office app’ option. Or just right-click on the Get Office app on the start menu and select Uninstall from drop-down menu. Get Office app comes back with every Windows update, so you need to manually uninstall it using above steps after every Windows update. Microsoft is a clever ploy brought in a new Tips feature in Windows 10 OS that pushes notifications about Microsoft services in the garb of helpful tips. These tips can get irritating when they regularly pop up and distract you in the middle of some important work related task. Some tips that you might have seen by now are related to improving battery life of PC, or use Microsoft Edge to earn reward points and more. 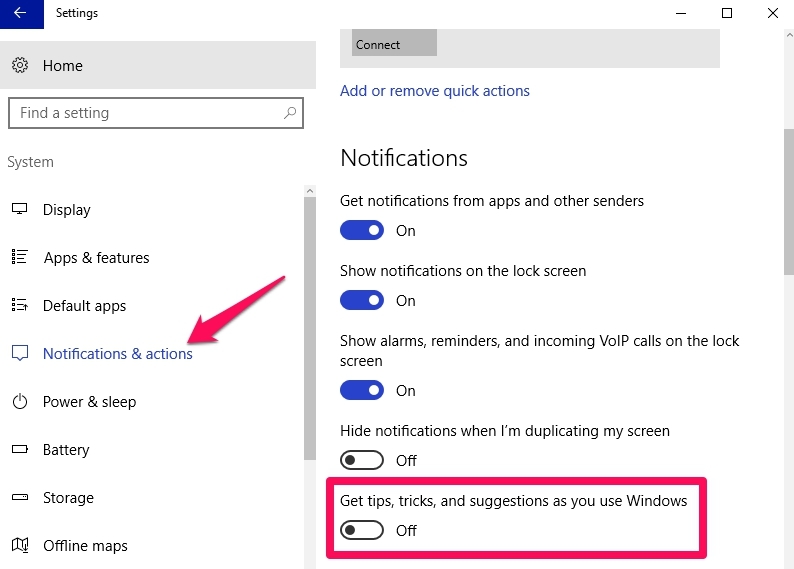 But you can remove these tips and keep using your preferred apps by navigating to Settings > System > Notifications & Actions and disable the ‘Get tips, tricks and suggestions as you use Windows’ option. That’s all for now. You have learn some easy ways to control and manage ads on Windows 10 so that they don’t bother you in the middle of some important work.